The online submission of the posts is open on 01st August 2018 and ends on 27th August 2018. The detailed eligibility and application process are given in below. Who are interested in Banking career, for admission to the one year Post Graduate Diploma in Banking and Finance (PGDBF) Course at Indian Bank Manipal School of Banking (IBMSB), which has been set up jointly by Indian Bank and Manipal Global Education Service Pv.t. Ltd. The selection process aims at getting candidates who are likely to succeed at various roles in the Bank. The endeavor is to select candidates who are bright, have good communication skills (both oral and written), are dedicated, can work effectively in teams, are passionate about their career goals and who display integrity and a positive attitude. The Bank reserves the right to allot the candidate to any centre other than the one he/she has opted for.No request for change of centre for Exam shall be entertained. 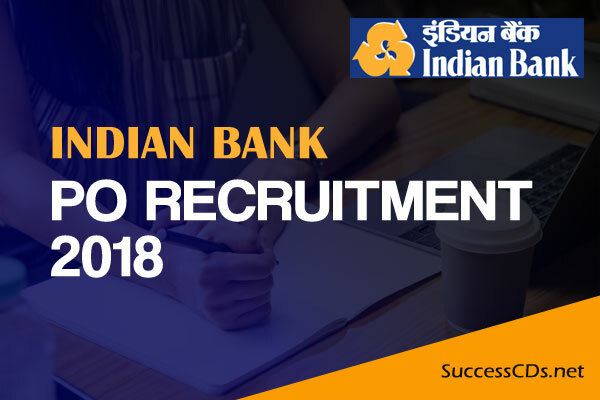 Candidates should select the Careers page in Bank’s website www.indianbank.in and open the link "RECRUITMENT OF PROBATIONARY OFFICERS THROUGH ON BOARDING" and click on "APPLY ONLINE FOR PO ON BOARDING"